In Mae Sot, we visited the Mae Tao Clinic, which was an absolutely incredible experience. 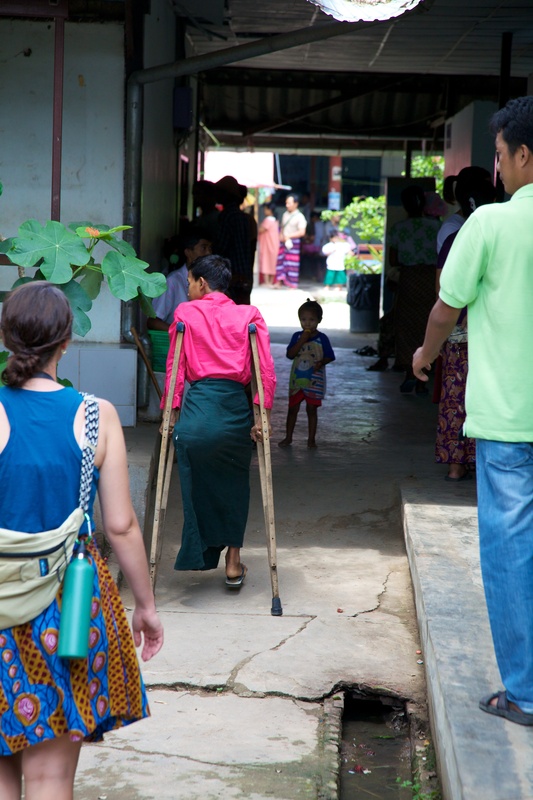 The clinic, just over the Burmese border, provides medical treatment for displaced Burmese people. Some patients are living in Thailand and have no other healthcare options while others traveled from Burma into Thailand just to receive medical attention from the clinic. I enjoyed visiting the maternity ward of the clinic and seeing so many new mothers holding or resting next to their newborn babies. The newborns I saw all looked like premies, but they may be smaller than children in the U.S. because of maternal malnutrition or lack of pre natal care. Also, abortions are illegal in Thailand so a lot of the babies or patients were results if failed abortions or abortion attempts, which was extremely shocking and sad to see. In the trauma unit, or emergency room, most patients were victims of land mine explosions. There was one woman who had two prosthetic legs and a man who had just recently had one of his legs amputated. The man was asleep when we arrived but his wife said that they, the young son included, had traveled for 10 days to get to the clinic. I realized that although they traveled for 10 days and the man had lost his leg, he was extremely lucky just to be alive and receiving the medical attention necessary to save his life. I think that this is why so many patients, with far worse ailments than patients in American hospitals, seemed so much more pleasant and even happy to be there. Also, most likely, the man would soon receive a prosthetic leg from the clinic. We visited the woodshop where they constructed prosthetic limbs for the amputees and surprisingly it looked identical to the shop class room at my high school. The one notable difference was the prosthetic limbs, predominately legs, scattered across the tables. There was one man working at the shop who had a prosthetic leg himself, which made me wonder if his own experiences had prompted him to help and serve others by providing them with prosthetic legs also. It’s amazing how much I noticed the people in the hospital, whether it was healthier patients or people who had obviously once been patients themselves, helping each other, especially the new and sickest patients. We also went to the pediatric ward, which was the most difficult for me. There were two small children in the room when we got there. The first was an adorable young boy, maybe 7 or 8, who smiled and waved back to me, gladly showed me his chart, and eagerly took a picture with me. He was so cute and just melted my heart. The second boy was much younger, only 1 or 2 years old, and most likely had malaria. Seeing this young boy covered with cool washcloths but still shaking uncontrollably with a catheter and IV’s in his body really shook me up. I have seen malaria patients in the past, but the severity of the illness in such a small child really caught me off guard. As sad as it was to see the amputees, malnourished babies, and sick children, I realized how amazing this clinic was and how lucky and grateful they all were to have a place to go and receive medical attention that many of them would have died without. This clinic is truly an amazing establishment.